Although it wasn't this particular model, this is the only one I could find with images showing the area in question. In any case while looking the helmet over, I quickly realized that what I "thought" was some kind of rear exhaust vent on the helmet may not be a vent after all?! The arrows in the photo below are pointing to the "part" I'm in question about. The bottom of this plastic attachment "looks" as though it has 3 small rectangles that resemble exhaust vents similar those on some other helmets. However if you look close at the close-up photo you'll notice that the 3 little rectangles under this piece actual have NO holes/vents in them to exhaust air at all! In fact the whole black piece (containing the 3 rectangles) on the bottom of this attachment is one solid piece. So that said, can ANYONE explain to me exactly what the purpose is for this plastic attachment on the back of the helmet. 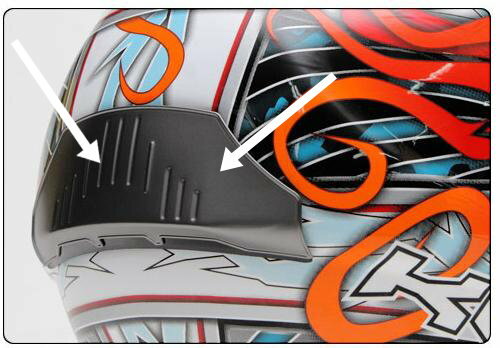 Keep in mind it's a standard feature on "ALL" KBC Magnum helmets. If it "IS" in fact a vent, can someone explain to me exactly how it works?! There are no "moving" part to this attachment to "open" or "close" it, although there is a tiny bit of space in between it and the helmet shell that is just a little larger than the thickness of your thumbnail. Well I answered my own question today with a phone call to KBC's customer service department. This thing "IS" in fact a vent. An exhaust vent to be exact. Still though, there's nothing on it to indicate that it is a vent, although most would assume it is one like I did. However with no visible ****, lever or even arrows pointing in the direction of opening or closing the vent to help "explain" how it actually works, you're left to your own imagination. And as heavy handed as I am, I was concerned about breaking it! That's actually why I posted this thread. There is also absolutely NOTHING in the owner's manual (what-so-ever) to explain how it works! The freaking owner's manual is WAY too generic, because it is the exact same owner's manual used with my KBC VR-2R! And the vents on the VR-2R are completely different! IMPO, you'd be lucky to accidently "move" the vent to finally understand how it works, leaving me to question the engineering design concept behind this particular vent application. It's actually pretty simple though and when explained how the vent works by a customer service rep, it kind of makes you feel like a babbling idiot! To "open" the vent you push down on the entire plastic part, which then opens the 3 rectangular-shaped vents on the bottom. Pushing up on it "closes" the vent. Go figure?! So for anyone who was curious like myself, you now know: it "is" a vent - and "how" it works. Last edited by TheoldF2Guy; 04-01-2010 at 10:32 PM. It actually makes a noticeable differece in pulling air across the top of my head when it's open vs. closed. The 'instruction manual' that comes with the helmet doesn't even mention how to open or close it. I followed up your PM from the other day with another PM explaining the "mess" I went through trying to also order the helmet from Bikebandit.com like you did. 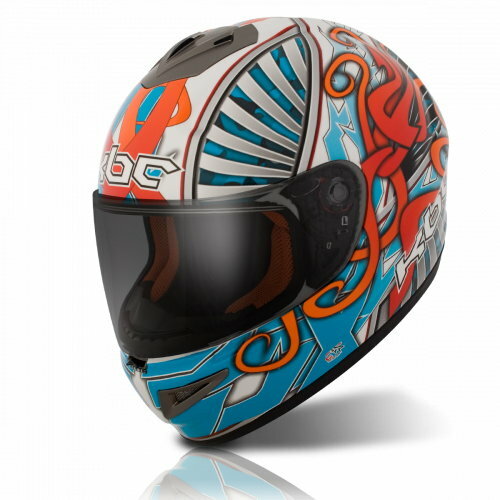 Not sure if you've read it, but the bottom line - they finally sent me an email telling me the helmet was discontinued and they canceled my order. So it was back to eBay having to accept the fact that I was going to have to pay "more" for the helmet PLUS having to also buy the dark smoke shield separately. So I spent a couple of hours searching the internet and found several places that had "all" the shields in stock - including the blue iridium/chrome shield! I ended up at Competition Accessories (http://www.compacc.com/) and just for the hell of it, decided to see if they had the helmet still for sale. They did but it was $10 more (on sale) than what Bikebandit.com was selling it for. So I called and asked if they would "match" the price at Bikebandit.com including the shipping, which was also $4 cheaper through Bikebandit.com. Long story short - they were willing to "match" the price. However it still meant I was going to have to "buy" the shield separately. So while I was on the phone with the sales guy ordering the dark smoke shield, I suddenly realized that the blue iridium shield was only $3 more! I asked about the shield and the guy offered to sell me the blue iridium shield for the same price as the dark smoke shield. I jumped all over it! Got the helmet in two days and the VERY first thing I see is a sticker on the box that says: FREE Dark Smoke Shield! I opened the box and sure enough there was not only the blue iridium shield I ordered separately, but also a dark smoke shield as well! So basically I got 3 shields (including the standard clear) and the helmet (including shipping) for $68! THAT IS ONE HELL OF A DEAL!!! In fact, it seems that this "free" dark smoke shield with the purchase of this particular helmet model is some kind of promotion "from" the manufacturer and not the independent dealers! So I'm now of the opinion that anywhere you order the helmet from is more than likely going to come with the "free" dark smoke shield at this point. In all honesty, if it hadn't been for you post in my review thread on my KBC VR-2R Alien, I would have never known about this helmet and probably would have passed on a SWEET helmet with a SWEETER deal! So a big "thanks" is in order. Last edited by TheoldF2Guy; 04-02-2010 at 10:54 PM. Quick Reply: What "IS" This? !